For those of you who haven't experienced the awesomeness that is the Nintendo Wii just yet, Nintendo recently announced a new advertising campaign that will bring their next-generation console to your driveway. 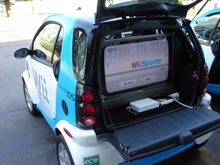 Teaming up with Smart Car, Nintendo will embed their Wii gaming console in a fleet of cars in Toronto (along with three other Canadian cities) in a cross-promotion for both the video game maker and the automobile company. Toronto residents who happen to be in the right parking lot at the right time will have the chance to get a feel of the Smart Car and also play games such as Secret Rings, Sonic, Tiger Woods PGA 07, Big Brain Academy, and the ever-popular Wii Sports. The Wii-Smart Car fleet is part of an advertising campaign called Key to Summer Fun (the website isn't live yet, but should be launching by next week) which aims to "get Wii controllers into the hands of people who haven't yet tried their luck with the wildly popular Wii technology, while getting up close and personal with the minuscule Smart vehicles." The campaign also includes a contest where lucky Canadians can win Wii systems or a Smart Car in September. There has been some discussion on the web (for an example, check out the comments at Kotaku) by Nintendo enthusiasts who are claiming it would be smarter for the company to ship more consoles to stores rather than trying to promote the product that is already flying off the shelves. The console manufacturer is still struggling to keep up with the demand for the Wii. Seeing as how the Wii is such a social gaming console and gets better when you're playing it with other people, I welcome Nintendo's efforts to get Torontonians together and play some Wii Sports in public, despite the lack of stock. Nintendo USA still has no plans to put the Wii Smart Cars on the roads south of the border just yet, so die-hard Nintendo fanatics will have to visit friendly border cities like Toronto in order to see them in action. While I am concerned that it may be a bit difficult to play the Wii on a sun-glare affected screen, this will be a great opportunity for anyone in the city that missed Rannie's Wii Tour earlier this year. And yes, I'm a bit of a Wii junkie, so I apologize now for any fanboy moments in this post: I've tried to control myself.